To live in nineteenth-century Britain was to experience an astonishing series of changes, of a kind for which there was simply no precedent in the human experience. There were revolutions in transport, communication, work; cities grew vast; scientific ideas made the intellectual landscape unrecognizable. This was an exhilarating time, but also a horrifying one. 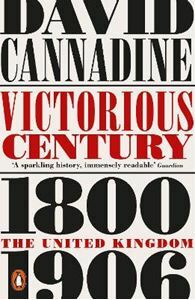 In his dazzling new book David Cannadine has created a bold, fascinating new interpretation of the British nineteenth century in all its energy and dynamism, darkness and vice. This was a country which saw itself at the summit of the world. And yet it was a society also convulsed by doubt, fear and introspection. Victorious Century reframes a time at once strangely familiar and yet wholly unlike our own.